PETERBOROUGH, ON –There was a festive, carnival mood at the Evinrude Centre this morning as United Way Peterborough and District launched its 75th Community Campaign. Over 250 people were entertained by a 24 piece swing band generously provided by New Horizons. United Way Partner Agencies were on hand and recognized for the years of service they have provided to the community. Some, like YWCA, having been funded for 75 years, while others joined the United Way family over the course of its history. 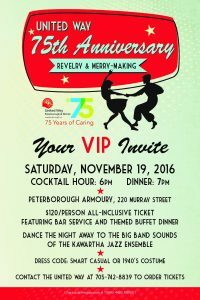 The slogan Peterborough’s 2016 Community Campaign is 75 Years of Caring. “United Way has always been about community, keeping it strong, drawing on its abundance and heart, ensuring hope for all” stated Jim Russell, CEO. Peppering the room were images and pictures from the 75 years of work by United Way. Many people could be found chuckling as they reminisced over images of their younger selves. 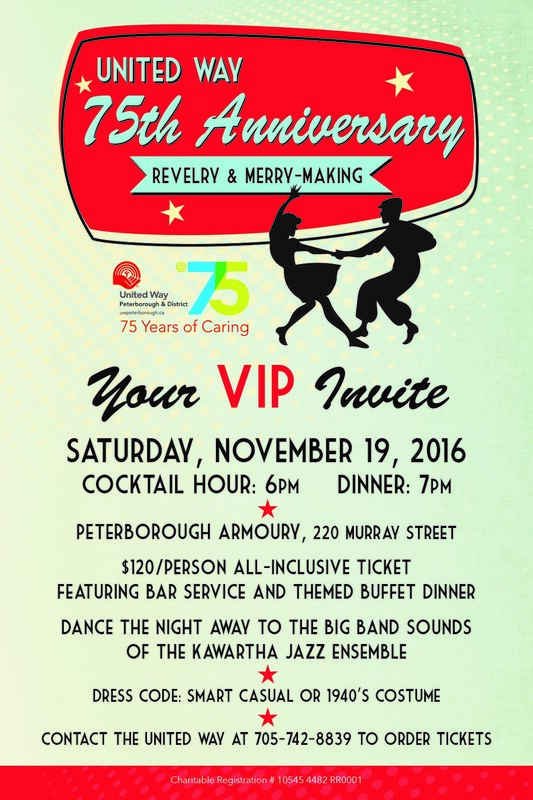 Len Lifchus, former CEO of United Way, this year’s 75th anniversary Celebration Chair drew 2 tickets to United Way’s 75th celebration being hosted at the Armoury on November 19, 2016, . Len Lifchus and Jim Russell lead the crowd in a rousing rendition of “Happy Birthday “while Ringmaster K tantalized with his circus performance art and was one of the highlights of the morning.